As a photographer, you can use your hometown as a backdrop for stock shoots—in fact, staying near home can make it easier to capture more natural photos… the kind today’s photo buyers are after..
For example, take a look at the shoot I recently did for a “Back to School” theme. It’s important to note that I shot these photos last May—remember, if you want your photos to sell as stock for a certain season, you’ll want to add them to your portfolio at least a few months before the actual season, since graphic designers buy images far in advance to make their ads. 1. Scout a location. In this case, I asked the local school and they agreed to let me shoot there during a holiday. In exchange, I gave them the photos for free. So, I didn’t pay to use the location. Most people love getting your professional images in exchange for letting you use their setting—be it a school, a coffee shop or a local boutique. Don’t be shy—the worst thing that can happen is that they say no. The next step was looking for a classroom with great natural light. I picked this ahead of the shoot. 2. Find models. To gather a few models, I did a “casting call” on Facebook. I have some friends in the area with kids but I needed more kids, so I talked to a teacher from the school. She made an announcement in her classroom, asking students if they wanted to participate in a photo shoot. Many said yes. 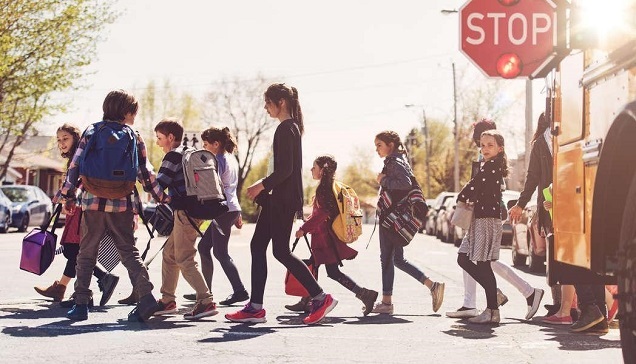 Their parents needed to know and be involved (and also sign model releases for their kids), so we started a private group on Facebook called “Back to School Shoot,” in order to let the models, parents, and teachers know what to expect. One of the teachers agreed to model, too. To have a real teacher was very cool as she knew how to entertain the kids, and she gave the pictures a genuine look. Clothing: Wear non-name-brand, no-logo clothing that is simple and casual (as they dress to go to school). Bring more than one outfit—in case any logos or colors that don’t fit sneak in. Food: Normally we have snacks and water for everybody. Meeting: Where to meet, what time, and how long the shoot will last. Skills and hobbies: I asked the kids if they have any skills or hobbies, like skateboarding, for example. Also, I asked if they had any pets or classroom animals, etc… there are plenty of additional scenarios you could create with this type of information. Questions: I invited the children and their parents to ask me any questions they had. 4. Planning as a photographer. Before the shoot, I wrote down ideas and brainstormed, while keeping a list for shopping for props. Then, I created a schedule (for example, 1 hour in the classroom, 20 minutes on the school bus, 30 minutes on the playground, etc. ), including many breaks as modeling can be very tiring—especially for kids. 5. The day of the shoot. After welcoming everybody, we talked for about 15 minutes to get to know each other and establish a rapport. I checked their clothes to be sure there were no logos or designs. I asked them to be natural, not look at the camera. Then I asked the models to play out a story for each scenario. While shooting, I looked for genuine expressions. Stock today is all about images that look real. Fake is out, authenticity is in, and customers are looking for genuine images. If you set up a shoot like this, always keep an eye on what happens, and try to capture the best, authentic moments. 6. After the shoot. Don’t forget to give photos to the location and your models—if they participated for free in exchange for your professional pictures. Here’s another quick example from a shoot I did three weeks ago with my niece and her friends at my house. There’s good natural light, genuine expressions, no-logo clothing, people playing out a story, and real-life friends. If you can, having real friends together makes it easier to get real fun and connection in your shots. 1. Dinner (including preparation, serving, and eating). 3. 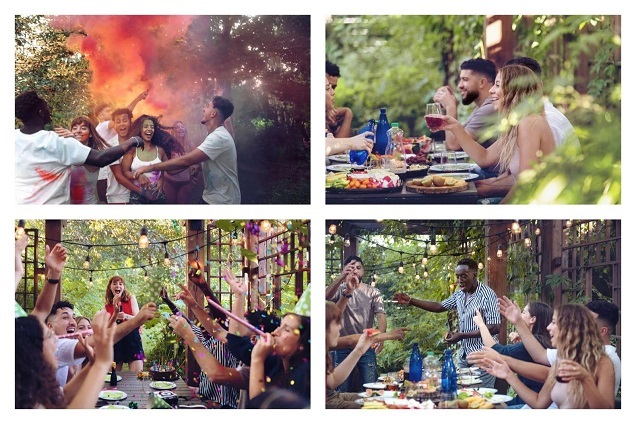 Party in the backyard with music, colored smoke, sparklers, and confetti. 1. Cast real people, real friends, and real family for the connection and authenticity. 2. Take the time to explain what you want and tell them the story they will act out. 3. Ask them to act as if you’re not there. 4. Capture real moments, emotion, and authenticity. Keep these tips in mind, and you’ll create some great, authentic images from your photo shoot.